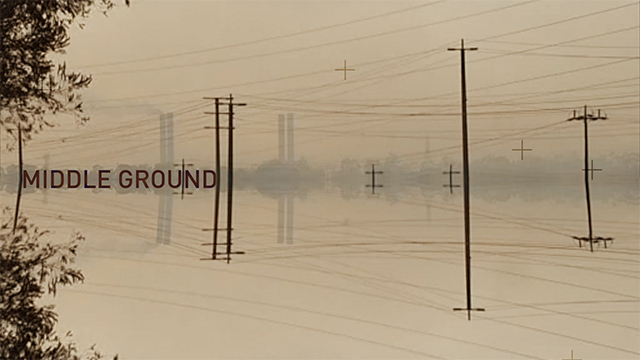 The film, Middle Ground_Morwell is the first of a series of short films which capture key moments occurring within the broader Transiting Cities- Low Carbon Futures research project. The compilation re-frames many of the images that were captured and televised during the Morwell brushfires that progressively took hold in the Hazelwood coal mine on the 9th of February, 2014. The Morwell landscape is a diverse landscape which has been through many transformations. These transformations continually happen, but it is often not noticeable unless significant events of change occur. The fires of February 9th, highlights the vulnerability of this resilient landscape. This manufactured landscape in the everyday, appears incredibly robust, but through the force of unpredictable events, reveals what makes this landscape, bringing it to the foreground of our views and understanding. The Middle Ground film is concerned with the landscapes that we all inhabit and consume. The very notion of the middle ground through the cinematic lens, is describing a ground that is in constant negotiation and change. The middle ground is never really central; it is a desire for how we may perceive the world.